VO2-Max is a term that gets thrown around a lot in fitness literature, but that doesn’t make it any easier to understand. So just what is VO2-Max? And just what does it have to do with our ability to undergo prolonged endurance-based exercise? It all seems like a simple concept, but it’s really an exciting physiological marvel, as your body attempts to maintain the fastest speed possible while simultaneously coping with an increasing lactate concentration and growing acidosis of the blood and muscles. Keep reading to find out more about VO2-Max, lactate threshold and endurance training; and how you can push your limits and achieve those new PBs! Effectively, VO2-Max is the ability of your body to ingest and utilise oxygen at your peak aerobic energy output. It is generally expressed in relative terms, as mL of Oxygen used per minute of exercise, divided by your body-weight in kilograms. This allows easy comparison between athletes in the same sport. Often, however, an absolute measure can be better for comparing between athletes in different sports. In this case we use Litres of oxygen consumed per minute, which removes the relative factor of bodyweight. VO2-Max is a measure of how much oxygen you are breathing in, how much is diffusing across to the working muscles and how much energy you are using while doing this. How do I know if I’ve reached my VO2-Max? VO2-Max is associated with a heart rate plateau, which occurs around the highest possible heart rate you’re able to maintain. Anyone who’s been to this level of physical exertion knows just how hard and painful it can be. So apart from the pain, why can’t we just push through and maintain a workload at this heart rate? How does Lactate and hydrogen play a role in all this? Remember how all energy systems are working at all times? The alactic, lactic acid and aerobic energy systems are providing energy in different proportions at all times (review this here). We also need to remember our good friends lactate and hydrogen, also known as lactic acid. They play a key role in determining how fast and hard we can work for prolonged periods of time. As our physiological workload increases with our increasing heart rate and exercise intensity, the aerobic energy system starts to rely on the lactic acid system to provide increasingly more energy for every increase in intensity. This results in slowly increasing levels of blood and muscle lactate and hydrogen accumulation, leading to a growing sensation of muscle burn as intensity increases. Now Picture 3 athletes, with identical relative VO2Max scores, all running in the same 10km race. Theoretically they should all be able to run at the same maximum speed, workload and finish the race at the same time. If this were the case though, competitions would be boring and could be determined without racing. So what is it that determines their finishing order? The answer is lactate, or more specifically lactate threshold. Lactate threshold occurs at a point of physical exertion where lactate and hydrogen begin to accumulate faster than they can be removed. This means that we have reached a heart rate zone where our anaerobic system is starting to become the predominant energy system, and its by-products lactate and hydrogen start to build up. Now consider that each of these three seemingly identical athletes have varying lactate thresholds. We can assume that the athlete with the highest lactate threshold, or fastest maintainable running speed, will finish first as they can run faster for longer, when compared to their competitors. Interestingly enough too, athletes with higher lactate thresholds can sometimes have lower VO2-Max scores than their competitors. This means that despite their decreased ‘fitness’, they may well be able to maintain a faster running speed and beat their fitter opponents. This could be the difference between a professional soccer player and a professional triathlete. A professional soccer player could well have a higher VO2-Max, but a triathlete will 9 times out of 10 have a better lactate threshold. How do we train to improve VO2-Max? As with most aspects of fitness, VO2-Max and Lactate threshold are both somewhat genetically predisposed and trainable. This means we can improve both, and overall improve our endurance running capacity and speed. First of all, how do we improve VO2-Max? Any ‘cardio’ workout at intensity greater than 75-80% max heart rate will, to some degree, help in improving your VO2-Max (ie your ‘fitness’). Higher intensity activities will provide greater fitness returns for shorter durations of training; such as high intensity interval training, 3km runs at race pace, 500m rowing intervals. Longer, slower, lower intensity activities like 10km runs at moderate pace may burn a lot of energy, but will not have as much of an effect on improving VO2-Max. 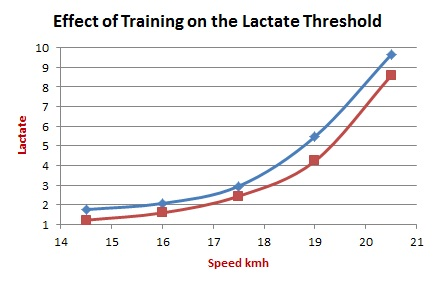 And how do we train to improve Lactate Threshold? The red line represents a downward and right-ward shift of the lactate curve, synonymous with improved lactate threshold. Any kind of moderate to high intensity activity will help improve VO2-Max to some degree. Conversely, to improve our lactate threshold we need to train in ways that specifically stress our lactate response and relate to improving lactate tolerance. This leaves two ways to improve lactate threshold: improve our pain tolerance for lactate accumulation, and improve our body’s ability to clear lactate. Any training at our lactate threshold is going to improve our ability to cope with lactate accumulation. This could include high intensity-long duration intervals, high volume intervals (ie 400m repeats) high intensity continuous exercise at or above our lactate threshold and super-setting exercises for the same muscle groups (e.g sprint 400m then ride a bike 400m at 90% max pace). The more we can train at or above our lactate threshold the more we can improve both our VO2-Max (fitness) and our ability to sustain higher workloads for longer times. 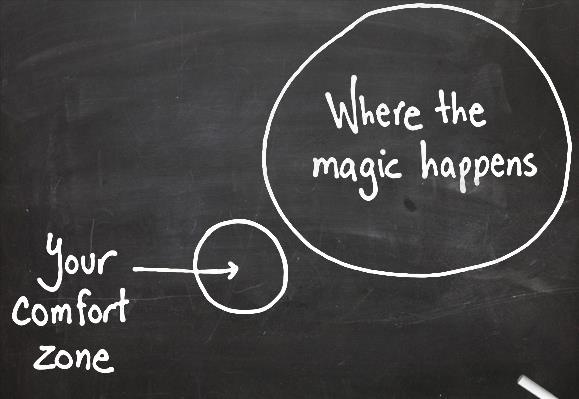 So get out there and give it a shot. If you need some help to push your training limits then get in contact and let ATLETA help you achieve your goals today.